I’m on the mend after sleeping off a four-day fever. I apologize for neglecting everyone’s blogs and will start catching up today. I think the old bod was telling me that I’d spent too many days happy-dancing the release of Soul Swallowers. Have you heard? D. Wallace Peach has released a new fantasy series, and news like that is worth our attention. Soul Swallowers is D. Wallace Peach’s best book to date, and that’s saying something. From her prior books I’ve come to expect expert plotting, three-dimensional characters, and truly magnificent world building. In this book, Ms. Peach has taken a single world-building premise—that people can swallow other people’s souls after they die—and worked it into a fantastic, detailed secondary world. Here, the powerful squabble for ever more influence while the wretches and unlucky are sold into slavery. The main character, Raze, has turned his back on a life of wealth and privilege, and joins another man in building up a small farm, a freehold, assisted by former slaves who soon become an extended family. Happy Reading whatever book you happen to be holding! 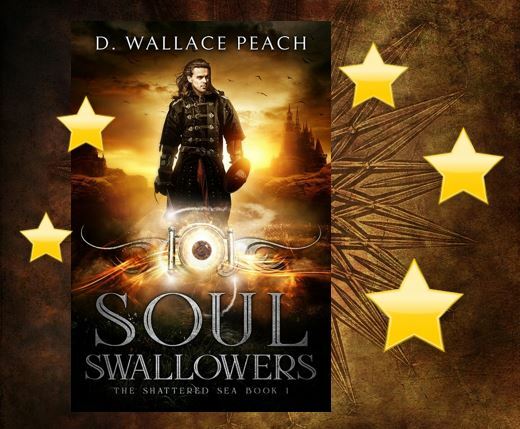 This entry was posted in Book Reviews, Soul Swallowers and tagged book review, Cathleen Townsend, Coming of Age, D. Wallace Peach, fantasy novel, five stars, heroic, intrigue, redemption, Soul Swallowers. Well, Soul Swallowers (and Raze) turned out to be just as interesting as expected from the cover illustration. What an entertaining story! Great world building and characters I cared about. Super job! I’m already well into Legacy of Souls and love it, too. There was one thing in book 1 that made me really sad, I admit. I’ll not mention it here, for fear of spoilers. But just wanted you to know I’ve enjoyed these, and now have to read ALL of your other work, as well. 😀 Nicely done! You are very welcome. I’m heading to bed to read more in about five minutes, and looking forward to it! Hi, Marcia. I love chatting about books. I’ll send you an email and we can connect. I’m so glad you enjoyed the reads. 🙂 Yay! I swallowed this book whole overnight 🙂 Looking forward to reading book #2 Absolutely stunned. Thanks, Hector! Sorry about the late reply. I was technology-free for two weeks. Back now and catching up. 🙂 Have a great weekend and I’ll be over soon. Welcome back D! I hope you had a wonderful technology freee fortnight!!!! Thanks. I just saw yours, Andrea. Thanks so much for reading and taking the time to review. 🙂 Yay! Isn’t it lovely, Julie. I’m not good at getting reviews lined up in advance, so I’m glad to see them showing up. The book looks happier on Amazon. 🙂 Thanks for stopping by to read! Happy Weekend. Thanks for stopping by to read the review. It was a sweet one and now the pressure is off. And I’m back to normal, whatever that is! Thanks for the well-wishes. Have a lovely weekend! Good news/Bad news. Your book is released (whoo HOO!!) with an excellent review, and your body releases itself into a “Phewwwwwwww”-like fever. Yes, I know exactly how it happens. Been there, done that. When I was in college, every darn Christmas I came home ecstatic that I finished all of my exams and papers, and then immediately came down with a fever and cold. Every time! Our bodies are miraculous in their ways of shutting down when we’ve been “ON” too long. I’m so glad you’re healing and rested now. I can’t wait to read your new release. Congrats!